From the personal collection of Rock and Roll Hall of Fame inductee and four-time Grammy winner Steven Tyler, this Hennessey Venom GT Spyder will be offered during the 46th annual Barrett-Jackson Scottsdale auction. Editor’s note: This is the 26th in a 30-day sponsored series featuring cars to be sold January 14-22 during Barrett-Jackson’s 46th Scottsdale auction. 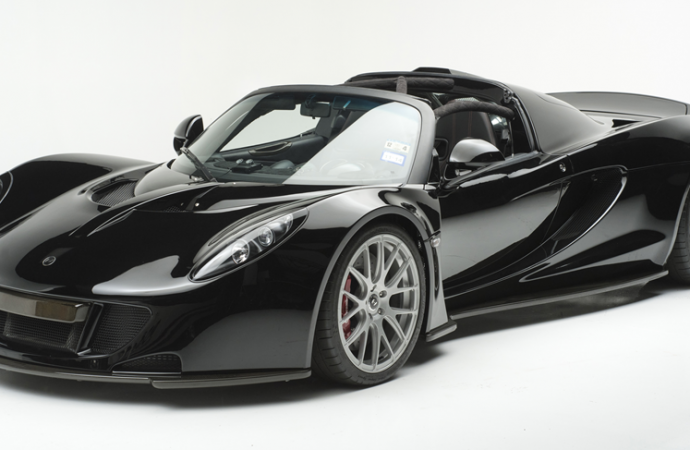 From the personal collection of Rock and Roll Hall of Fame inductee and four-time Grammy winner Steven Tyler, this Hennessey Venom GT Spyder will be offered Friday, January 20, around 7 p.m. during the 46th annual Barrett-Jackson Scottsdale auction. The car is the fifth of just 12 Hennessey Venom GTs and is the first of the Spyder convertibles. The mid-engine, rear-wheel-drive car produces 1,244 horsepower from its 7.0-liter V8 that pushes the convertible to 60 miles per hour in 2.7 secounds and from zero to 200 miles per hour in 14.5 secounds. To achive that speed, the cars body consists of carbon-fiber with a composite/aluminum hybrid monocoque space frame. Other features include 6-piston Brembo fixed-caliper brakes with carbon-ceramic rotors, rack & pinion steering with 6-position variable electric assist, Ricardo 6-speed manual transmission, unequal-length A-arms and anti-roll bars, Penske 2-way adjustable coilovers and adjustable ride height. Additionally, the car rides on Hennessey H10 forged monoblock wheels wrapped in Michelin Pilot Super Sport tires. The supercar will be sold with 100 percent of the hammer price benefiting Janie’s Fund, a philanthropic initiative created by Tyler in partnership with Youth Villages to bring hope and healing for girls who have suffered the trauma of abuse and neglect.